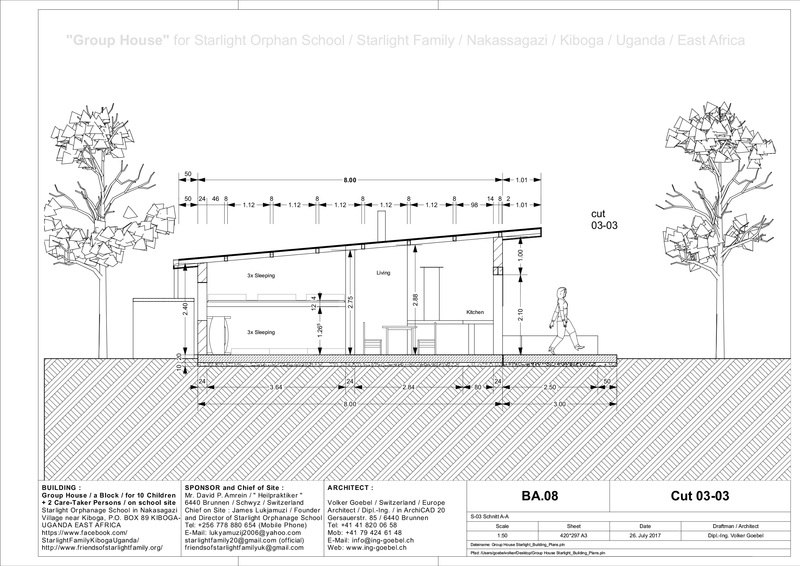 Building plans for a Group House for Orphan School in Uganda / Sponsor David Amrein / Architect Volker Goebel / MGKB building contractors Ltd.
buildings to improve the living and sleeping situation of many children. 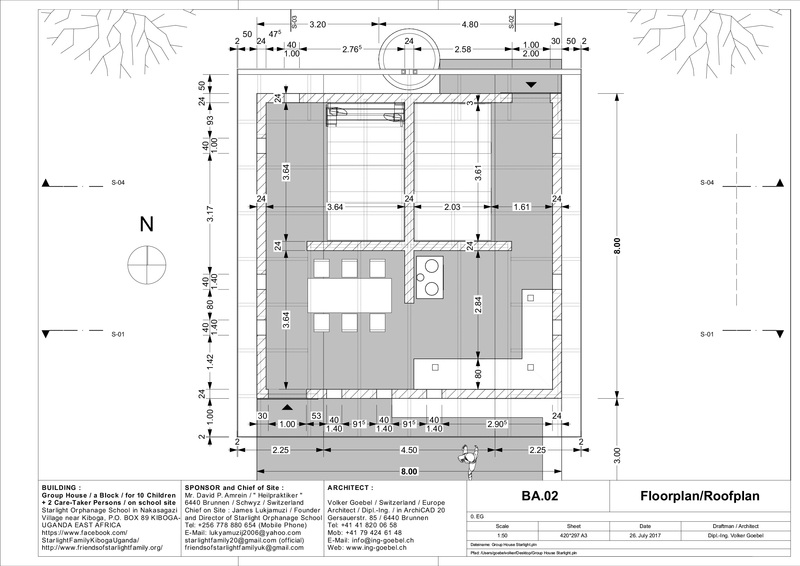 The building plans are very much connected to a first budget given. 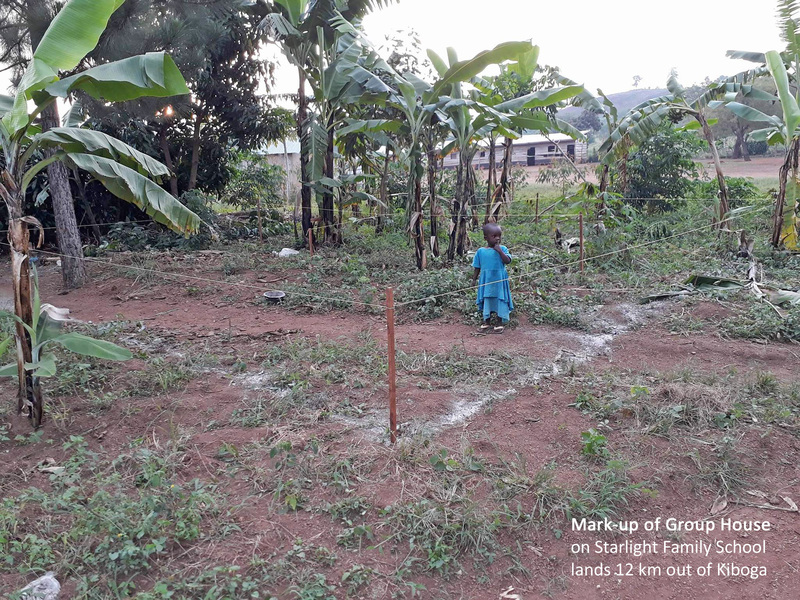 Using local materials, connecting to local traditions and local needs. 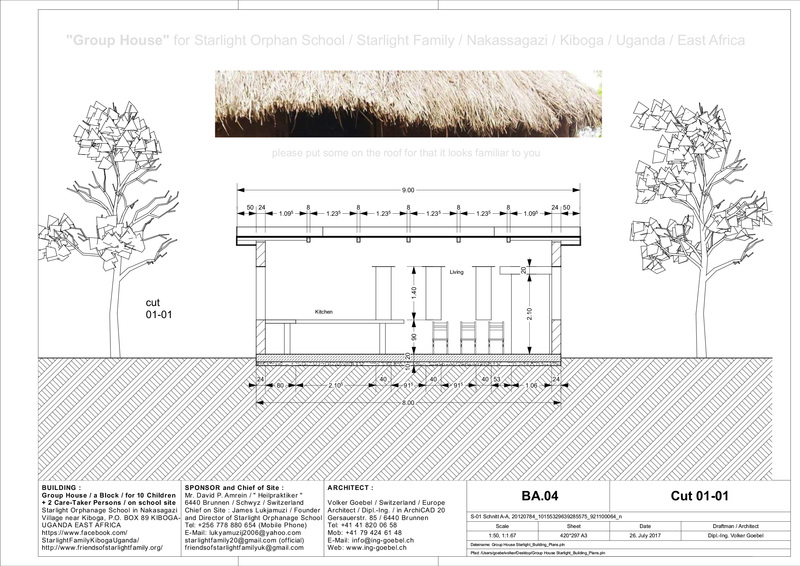 This is a charity engagement, the plans are provided without charge. 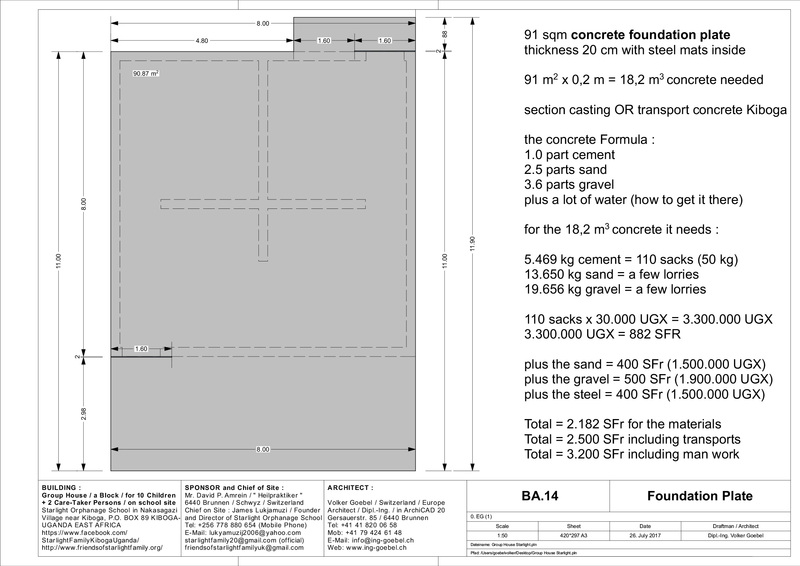 As architect/dipl.-ing. i already did such plans for UN in Afghanistan. 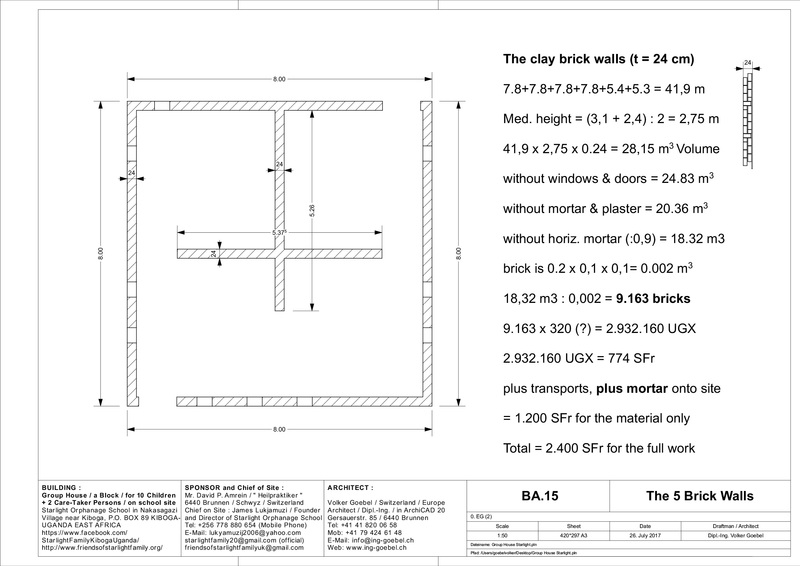 "Since everything else is in order, submit the drawings to the District Physical Planner for processing." 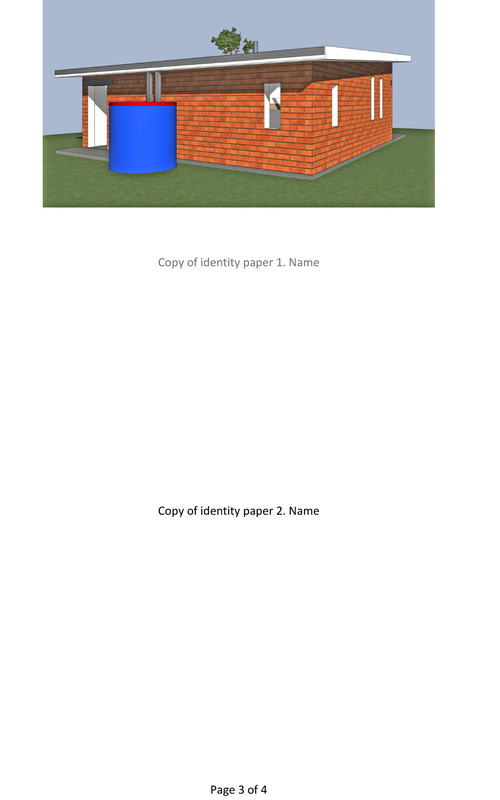 and his adress - once again we ask you for this persons contact data. 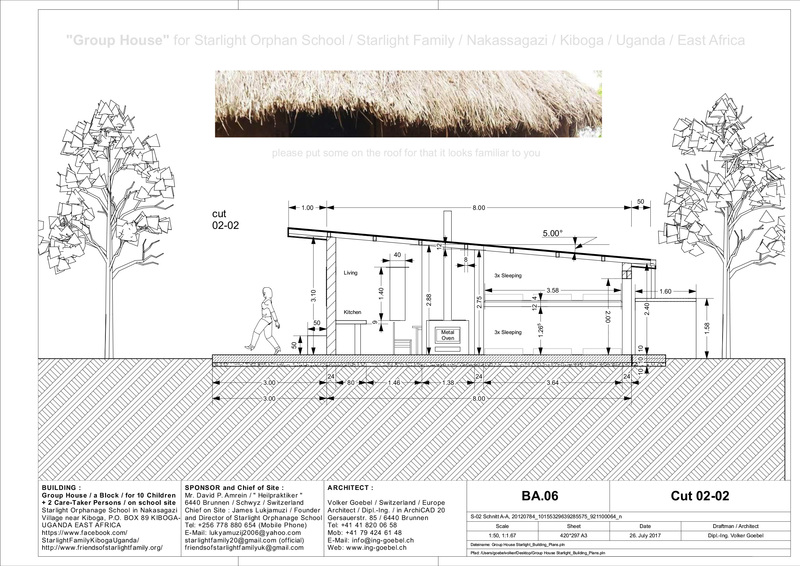 PLEASE DONATE - we still have no roof for the GROUP HOUSE ! 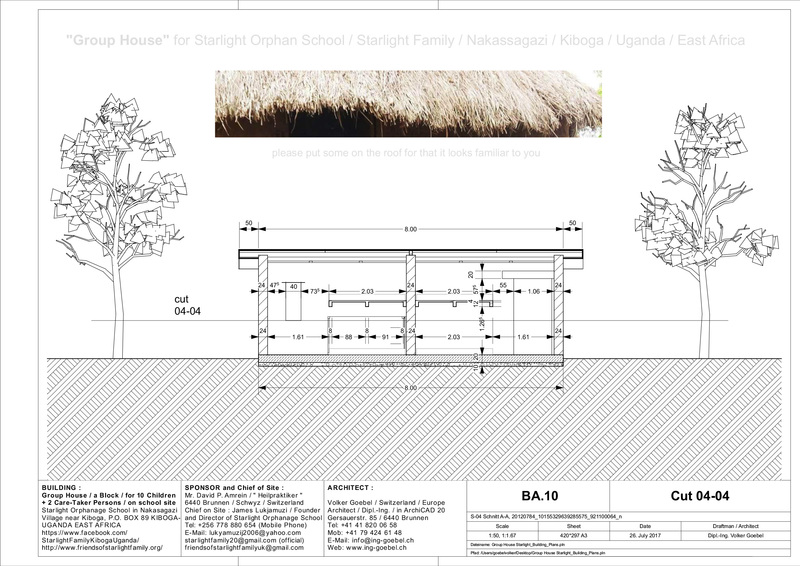 Shall we leave the 10 orphan kids in a house without a roof ??? 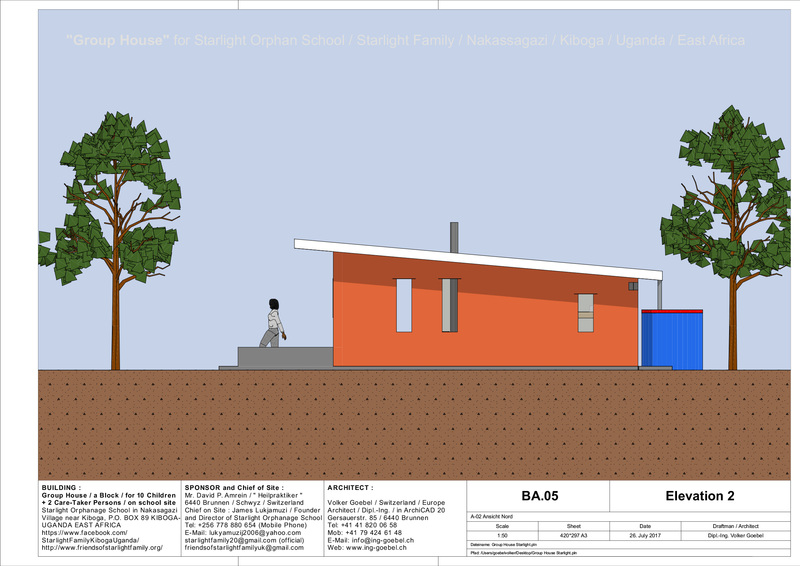 houses, then it is Uganda - the youngest population i have ever seen. 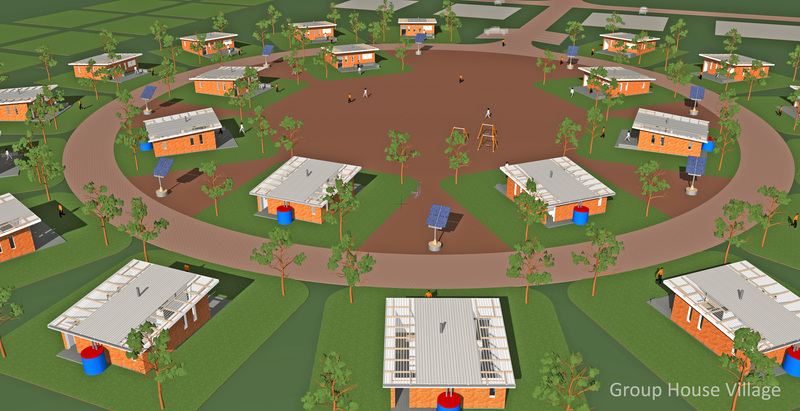 will need huge programms to build 500.000 new group houses / year. 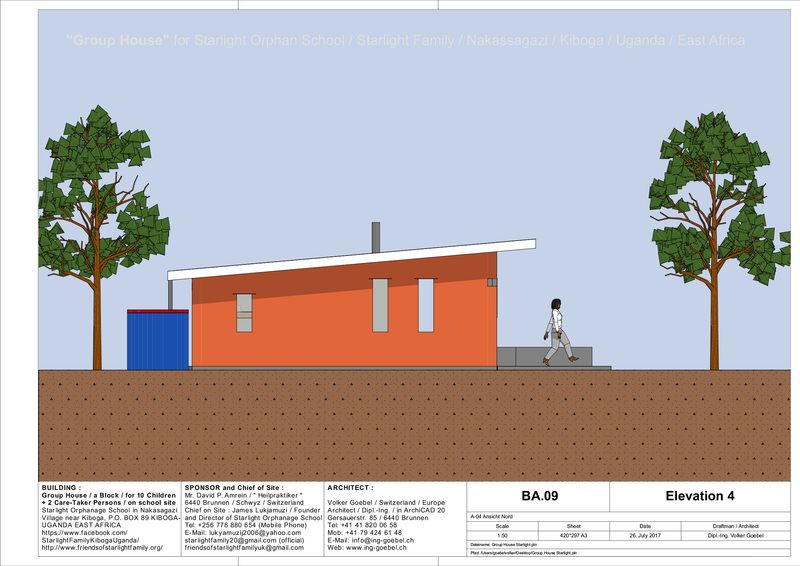 able to build such a massive amount of new homes for Uganda people. program the country has ever seen. 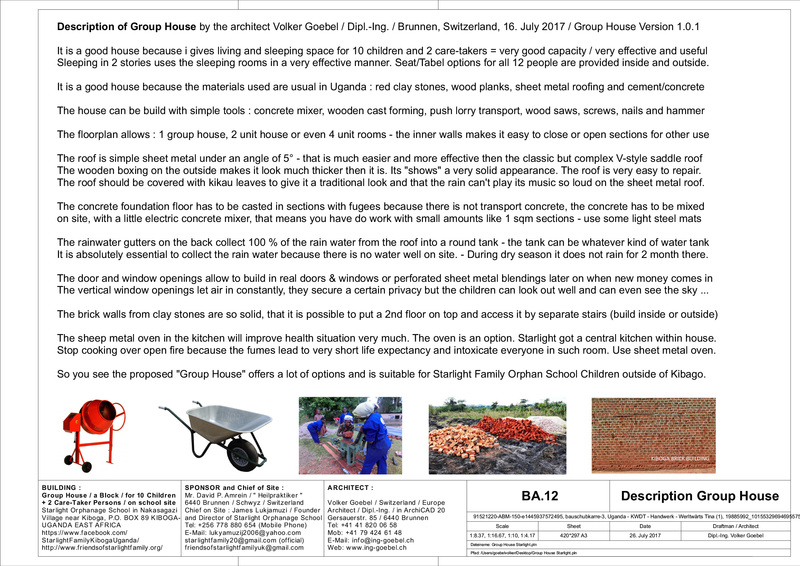 Group houses for all the people. 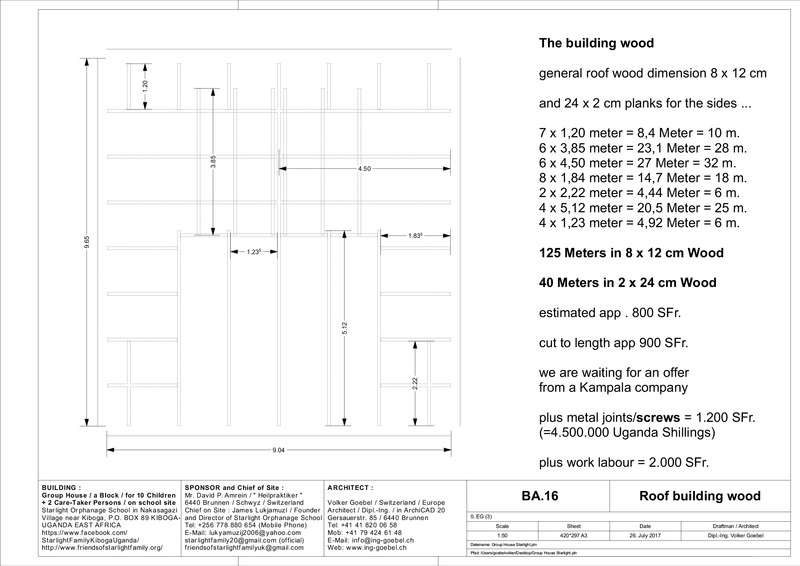 on Facebook we had 473 Likes for these building plans within a week. 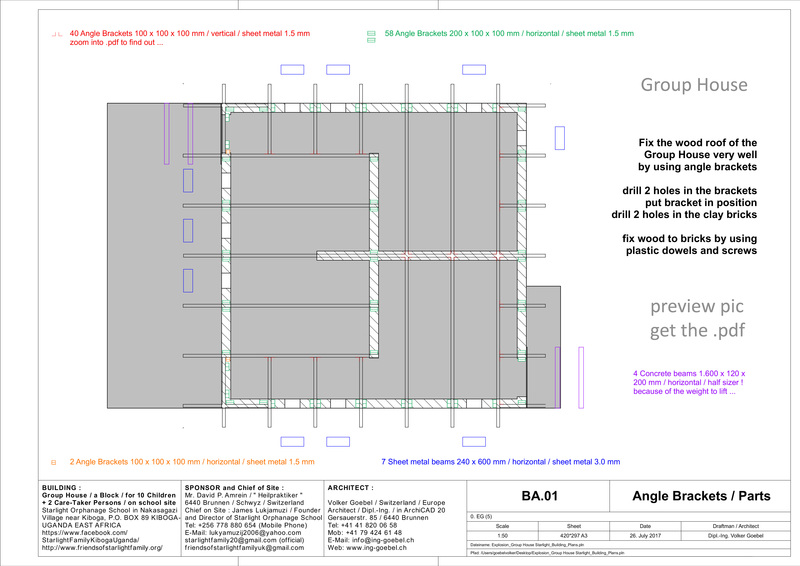 - Do we need a building permit ? 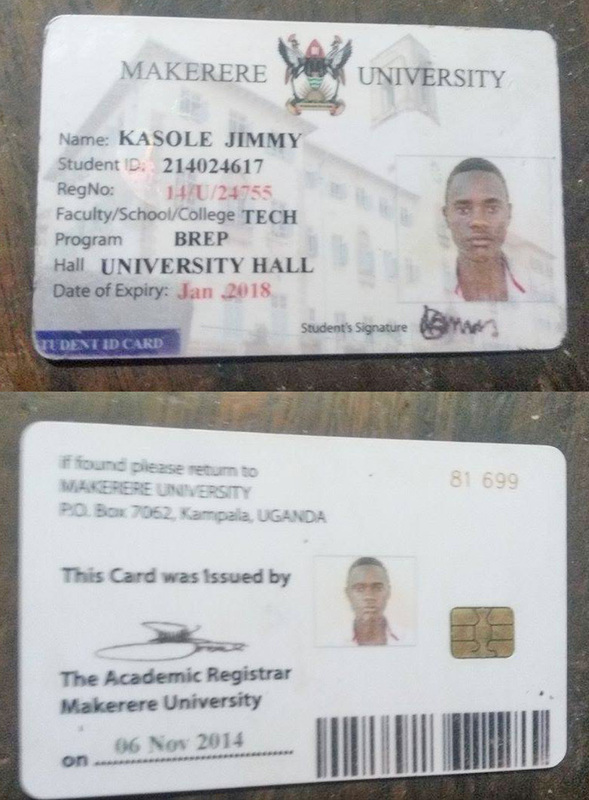 James, please ask Kiboga. 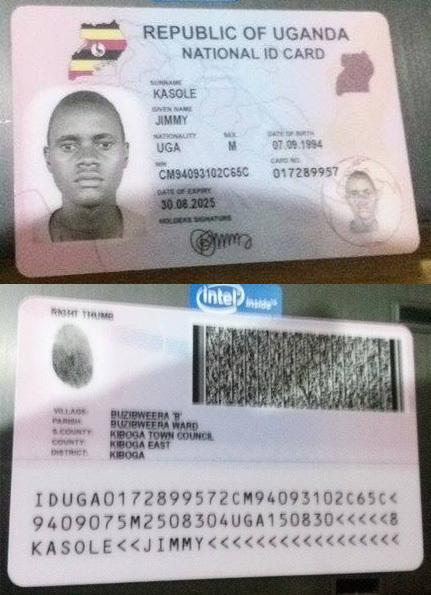 Father of Jimmy Kasole / experienced BUILDER on site ? 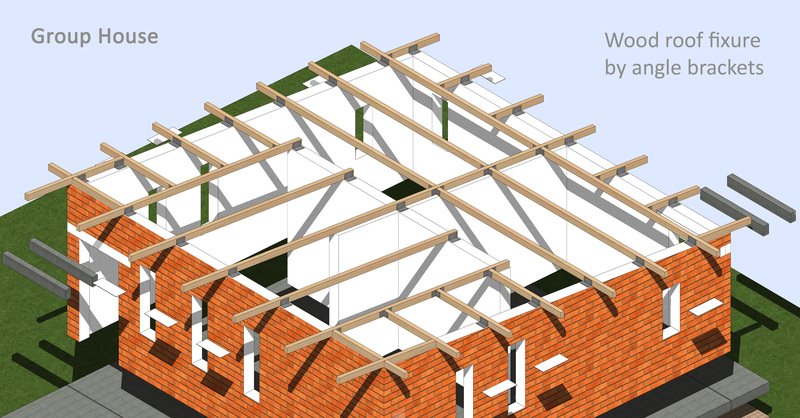 Nirvikalpini Nithya UK / Financing by Crowd Funding !!! OR a local building company gets the full contract ! We are waiting for a quote to come it to compare. 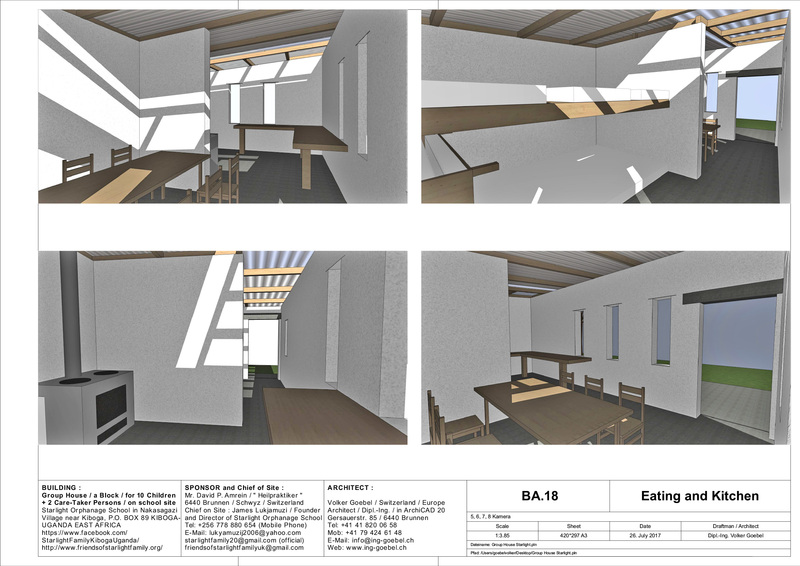 Calculation for Group House is on 90 % - further dev. 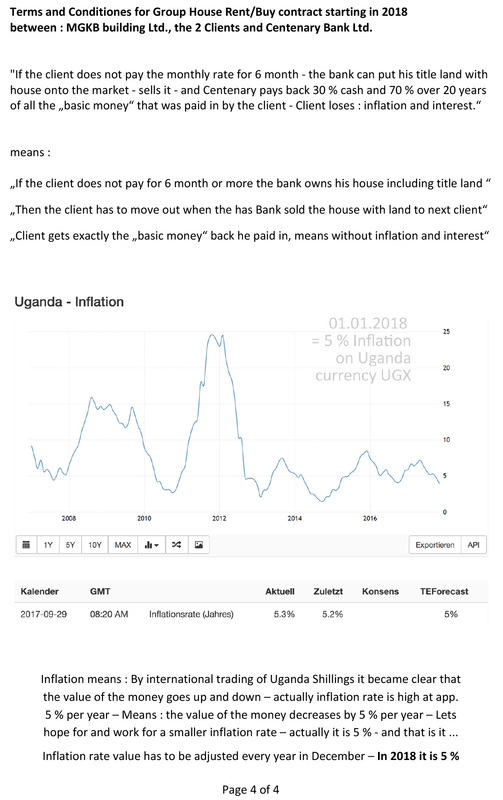 by Richard Mogashu - Excel Sheet is going to be public. 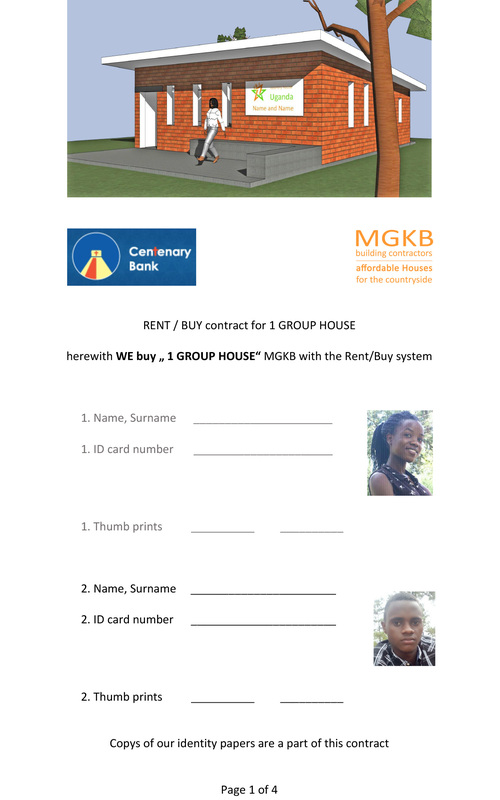 we have 6 weeks now to find the money for Group House ! 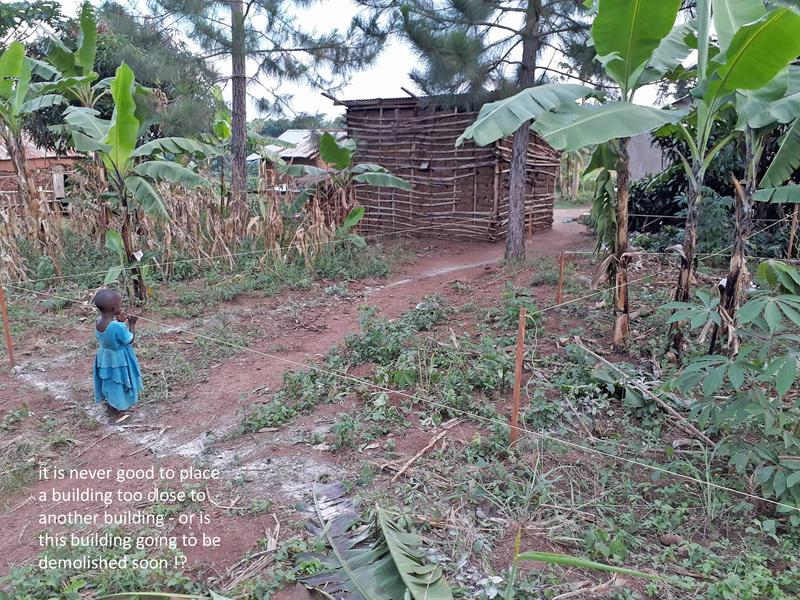 the 2/3 means we are on 66 % funding now - thank you D.
it is them who provides the second third that David promised us ! 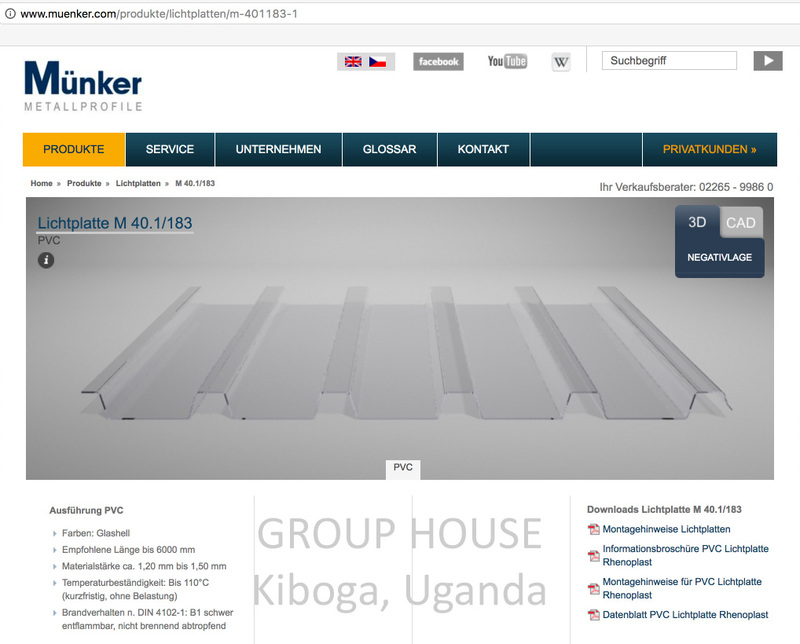 Many thanks to Schubert Verlag Leipzig in Germany. 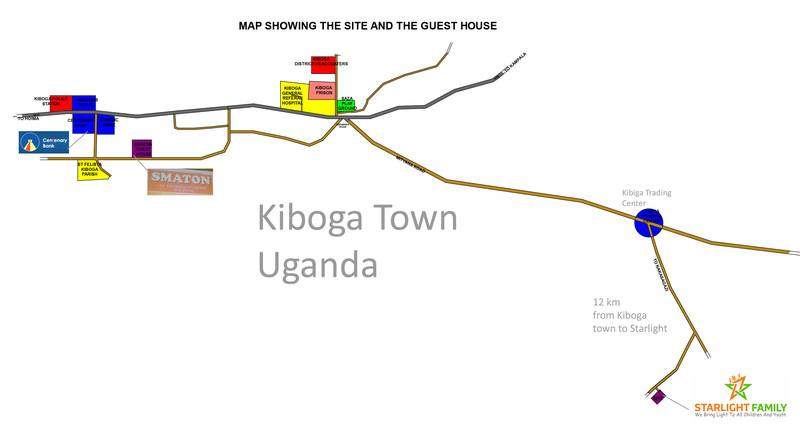 Dr. Frank S.
the transportation to 12 km out of Kiboga. - The 18.000 USD are correct ! 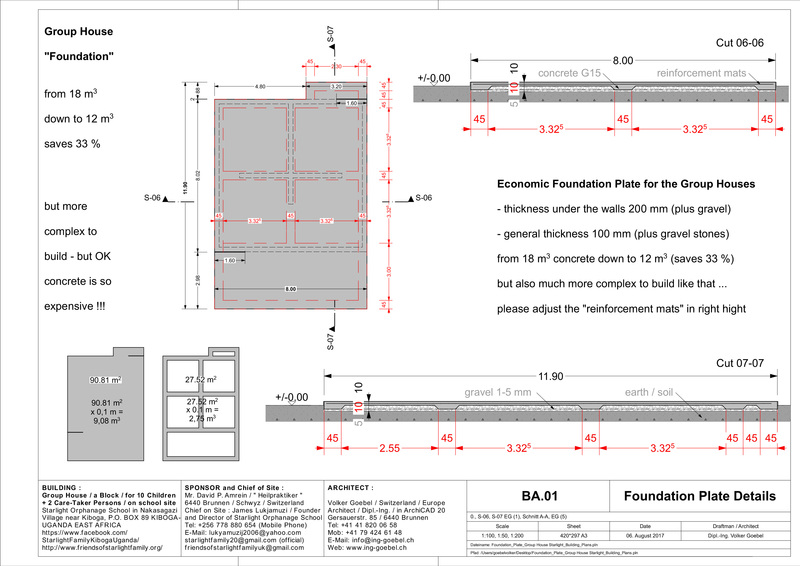 We overworked the foundation plate planning to save 33 % concrete ! we do NOT accept any "banana bricks" from bad casting forms !!! 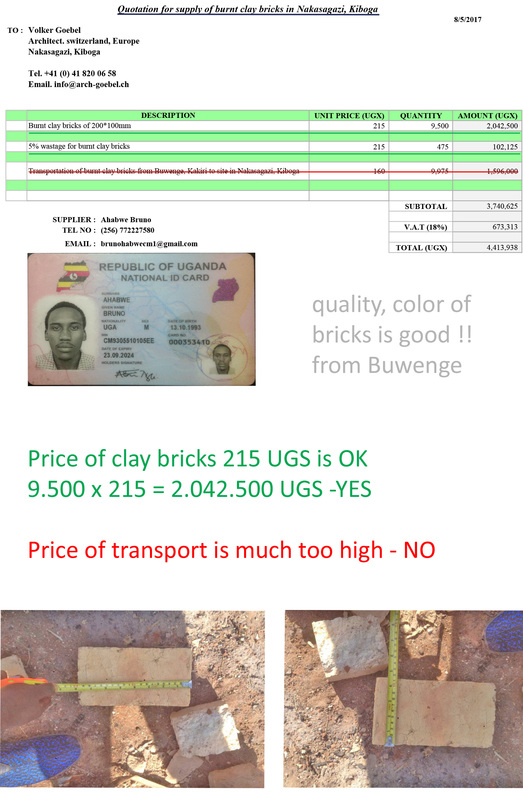 some color powder or yellow sand to provide us " a happy bright color "
---yes it is 31 tonns to transport over 235 km - Buwenge is too far !!! 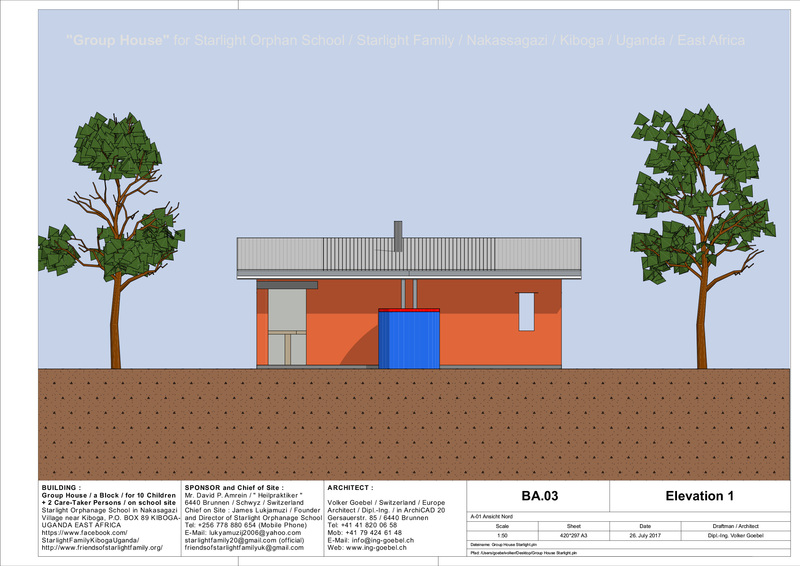 good example is build with the bricks of the Uganda Clay Company Ltd.
can not work - working on rain days is also a problem - means 50 % !!! have to sign a contract with your bank. 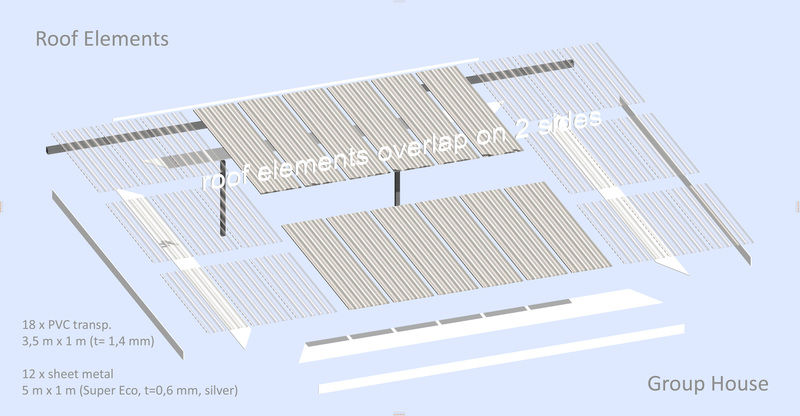 20 % upfront, rest over 20 years. 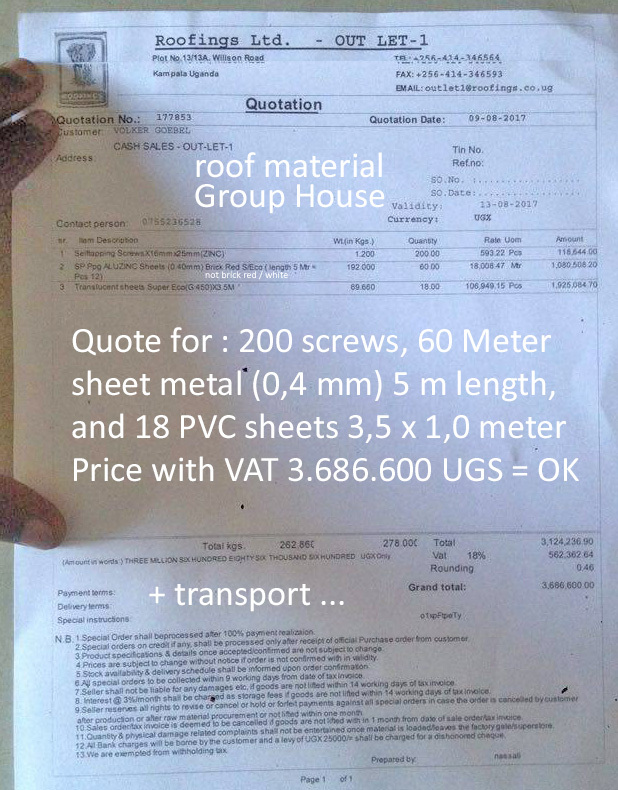 We are going to establish such Rent/Buy also called Lease/Buy contracts. 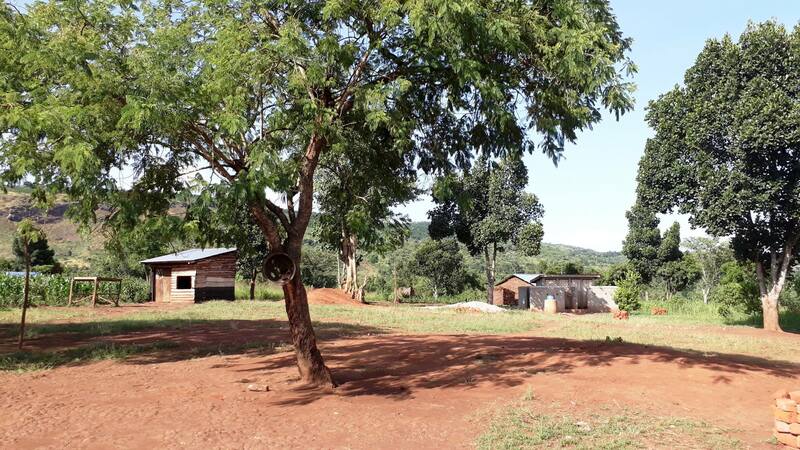 local bank in our office and you go out and walk you to your new house ! 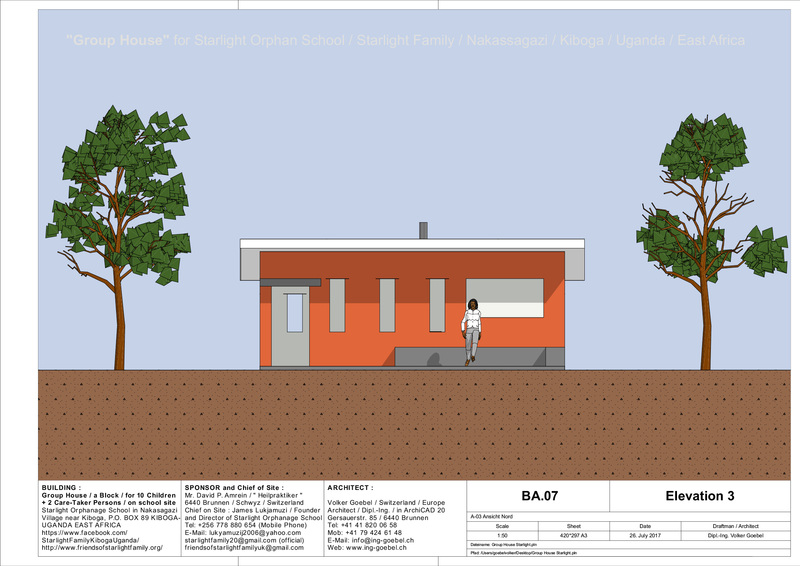 Houses in Uganda. 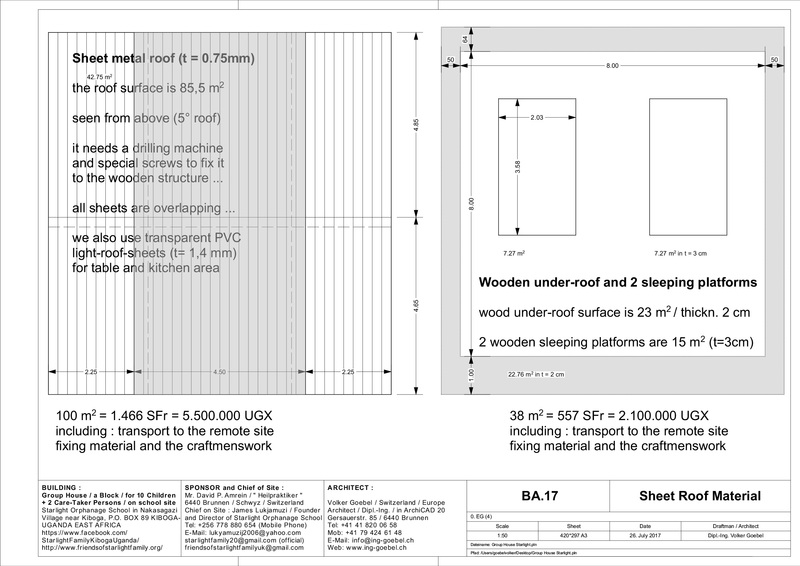 We do no build any villas - we only have one product. 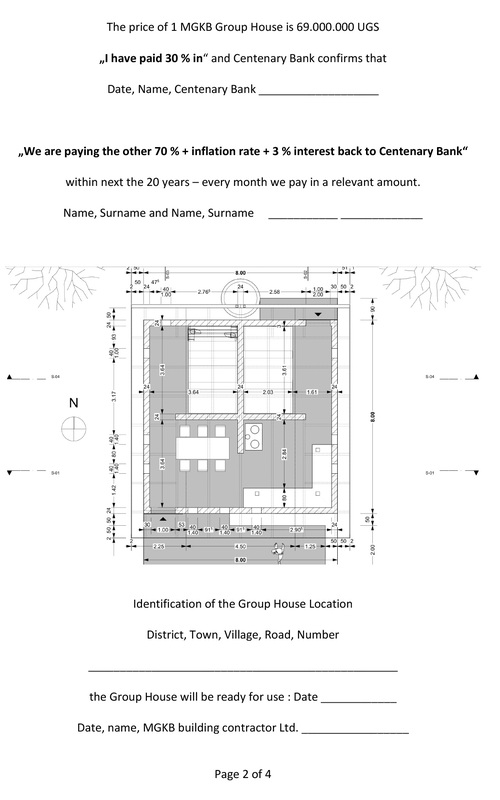 you can have a closer look at the contract for 1 Group House already ! 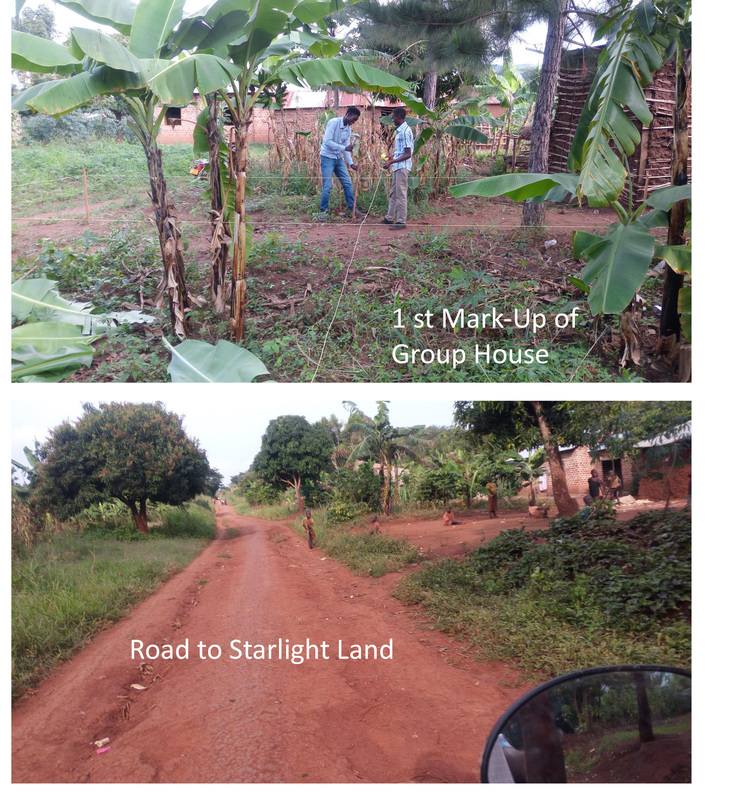 and we have bought land in Kiboga District we can sign the contract too. 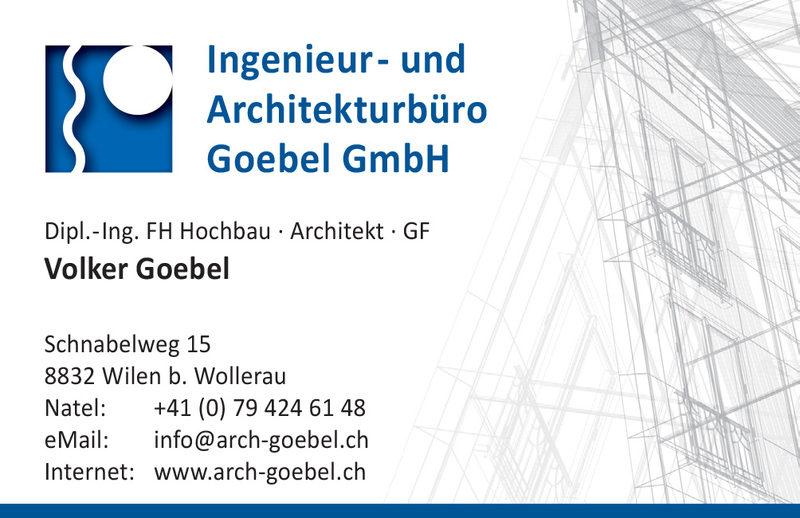 Best regards and sincerely yours - Volker Goebel / Architect / Dipl.-Ing. 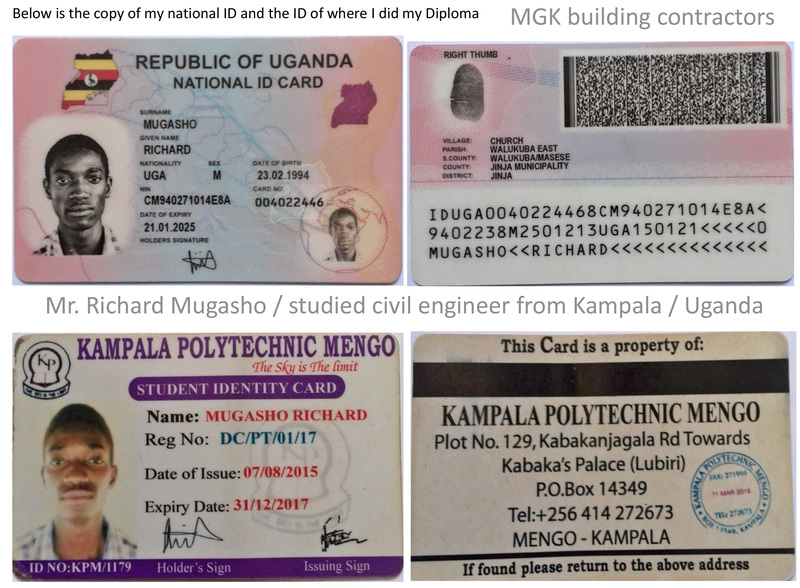 and Richard Mogashu / Civil Engineer. 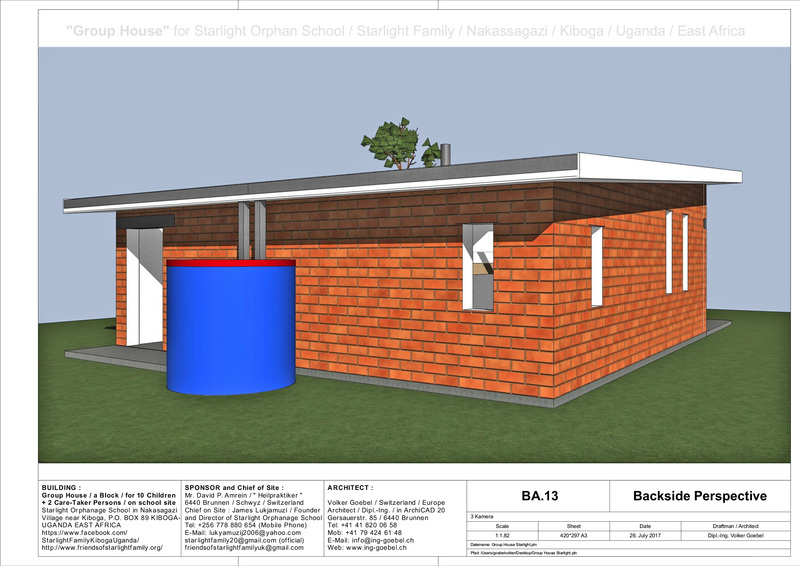 We are a building contractor soon. 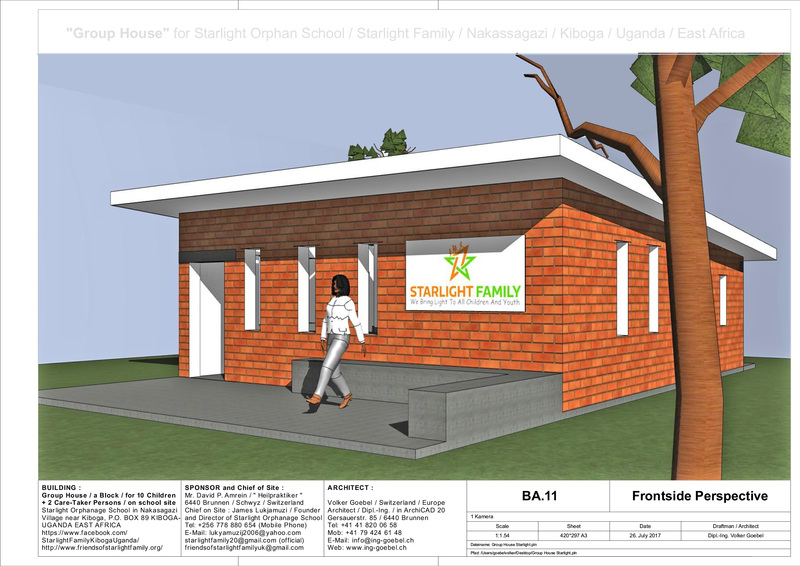 Building the first "Group-House" for Starlight-Family is the first task !! !